Information: Constance V. Mynatt, author of books about folk dance. 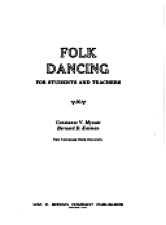 Folk Dancing For Students and Teachers, 2nd ed. Mynatt, Constance V., and Bernard D. Kaiman, Dubuque, Iowa: Brown, 1975.